205 – the nominal width of the tyre’s cross-section in millimetres. 55 – is the ‘aspect ratio’ – the ratio of the sidewall height to the cross-section width. R – stands for radial construction. 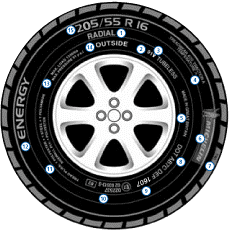 16 – stands for the nominal diameter (in inches) of the wheel that the tyre is designed to fit.